1961 – Six Flags opens their first park ever. How awesome is that?!?! I love roller coasters and amusement parks. 1774 – Jason Priestly discovers oxygen. I joke. It was his great-great-great grandfather Joseph Priestley. 1941 – The Jeep is born! Beep, beep, who's got the keys to my Jeep? Vroooom! 1972 – Dubyah gets suspended from the Air National Guard. Sure he just missed a medical exam, but it's fun to point out his flaws. 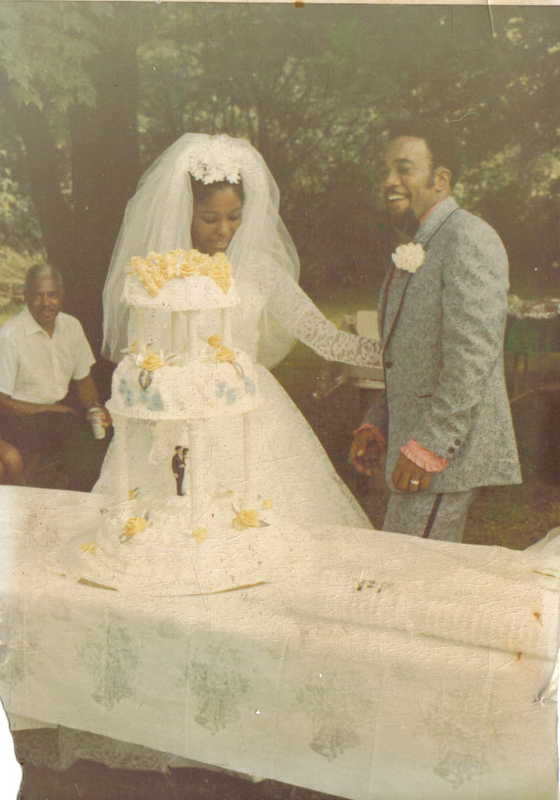 1970 – Jesse Burkes, Jr. weds Stephanie Madison in a beautiful ceremony 70's style. This one's the most important this day in history. :-) Would have been 38 years today. Kinda nutty. MommaShyner got married at 20! DaddyShyner was a great big 25. Weren't they rocking their gear? Bwahaha, just noticed that their cake toppers are white. Funny, I knew I wanted an outside wedding (even though theirs was technically in the church) long before I saw these pictures. I'm such a rebel. No gown, no veil, probably no white. Happy Anniversary (in spirit), Mom and Dad! I seem to recall it being a salmon color because I remember seeing it in the house one day or another. No photo? Oh noes! You're from Pennsyltucky too? (or at least your parents?) I live just outside Philly and my dad is from the city but my mom is from up in the coal cracking region (near The Office, Scranton area). I don't think I knew that about you or else I just plum forgot. Oh, I'm from Pennsyltucky for realz! I was born and raised in the southwest corner. Not quite Ohio and too close too West Virginia. But I'll claim Pittsburgh for life! I probably haven't mentioned the exact location very often. Oh and my parents just had a small wedding (I don't *think* it was a shotgun wedding!) like 10 people or something but still, not ONE photo? My mom kept her dress though, it was a 2 piece lacy knee length thing, it was pretty. I bet she looked cute. From the photos (the other ones), I don't think the wedding was huge. I'm guessing there were maybe 30 or so people there but they were mostly family and stuff. I wonder if I could Photoshop some color back into those bad boys. oh that would be so cool! I think my mom chucked the dress a few years ago or last year when she moved, it had deteriorated. Lovely Photo-So reminiscent of my parents wedding photos. Was that in BV? It looked like a beatiful wedding-your mom–soooo pretty. Aww, I'll say thanks for her. She stops by occasionally but she won't set up a blog to comment, so thanks from both of us. Thanks! I have to look into seeing if I can get the whole bunch of them restored somehow.